By default, Outlook Express will send email messages with rich formatting - a fancy term to imply that you can use different fonts, colors, bold, underline, italic, and other text processing commands inside the body of the emails you compose and send. Since "HTML" or rich format is so widely supported by today's email programs, this isn't much of an issue - however, especially if you are using graphics in your messages (either plain old clipart images or topical pictures), recipients of your emails may have several issues, the least of which is that they need to manually approve your message as a legitimate piece of communication before their email program or webmail client (Hotmail, Yahoo Mail, Gmail...) allows the full content of your message to be seen. For this reason and others, Outlook Express lets you customize that sending and make it always send emails in plain text (no formatting, no pictures, etc. - just text) - which guarantees that your emails will not face some of the problems we mentioned. Click on the Tools menu and choose "Options": Outlook Express will open the Options dialog with the General tab selected; select the "Send" tab, which controls the settings affecting messages you compose from Outlook Express on your computer. Under "Message Format", we recommend that you leave all default settings unless you are an advanced user and/or have received specific instructions to the contrary. 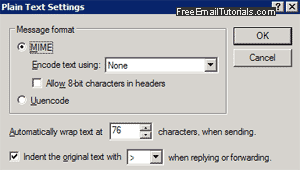 To ensure that people don't receive your plain text emails with a huge horizontal scrollbar at the bottom, Outlook Express will automatically "cut" each line, and resume the rest of the plain text email message after putting it on a new line, etc. Doing so after 76 characters is a good number, which supports small screen resolutions (you could increase the number of characters before Outlook Express "force-wraps" a line, but this could cause the horizontal scrolling problem we mentioned, for people who still use a small screen resolution, like netbooks or old computers and monitors). "Automatically wrap text at  characters, when sending." Finally, Outlook Express lets you choose which character to use, if any, to distinguish your email from the one you are replying to, by starting each line with (by default) a closed angular bracket (">") at the start of each line of the original message. "Indent the original text with [>] when replying or forwarding." Once you are done, click on the "OK" button to save your plain text settings, and click "OK" once more to close the Options dialog and return to Outlook Express.